This is based on MamaC's recipe..buried in one of the posts she had written here. I made 750 ml of it successfully. And have given it out to my students when they came for class. Its very easy but time consuming..its a long waiting period. 1. Wash a bottle and make sure its cleaned and completely dry. 2. 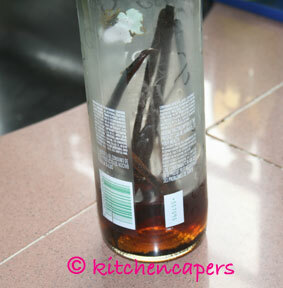 Cut and scrape out the vanilla seeds and add it into the bottle. 3. Using a fennel, pour vodka into it. 4. Cover the bottle with a cork and leave it to stand for at least 2 months or more. 5. By a week's time, the vodka will turn slightly browned. 6. At every 2 weeks, give the bottle a good shake to mix it evenly. 7. Its ready to use as per recipe after the long wait. 8. It does not need refridgeration. Can leave it out in the kitchen. Never leave it in a plastic container/bottle. Wine is acidic and will react to plastic.